INCIDENT ADDRESS: 2627 South Southeast Blvd. 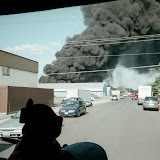 NARRATIVE: At 10:05 this morning, March 6, 2008, the Spokane Fire Department was dispatched to the area of 27th Avenue and Southeast Blvd. for smoke reported in the area. Upon arrival, the first engine investigated and found a 2 ½ story, single family house with smoke issuing from the basement. A full structure alarm was requested, responding four additional engines, a ladder, a rescue truck, and two Battalion Chiefs. Crews forced entry and attacked the fire, while other crews ventilated and searched for victims. The were no occupants home at the time of the fire. The fire was knocked down within ten minutes, but complete overhaul of the burned area took nearly three hours. There was heavy fire and smoke damage to the basement and additional heat and smoke damage to the upper floors. 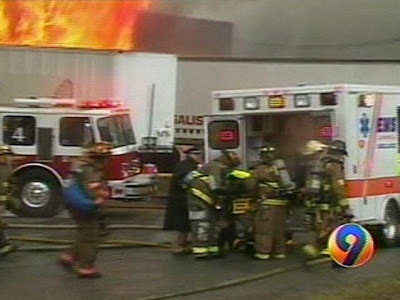 There were no firefighter injuries. The homeowner arrived while crews were still on the scene. The homeowner lives alone, and will be unable to occupy the house until repairs are made. The American Red Cross is assisting him with lodging. PROBABLE CAUSE: The cause of the fire was determined to be a wood stove in the basement, installed with its chimney too close to a combustible wall surface. DAMAGE EXTENT: There was heavy fire and smoke damage to the basement and additional heat and smoke damage to the upper floors. It looks like their meetings are a little more lively, but not as well attended. Thanks to Dean Carr for sending this information. If I read this correctly, they are "letting" Todd have a computer image of his hard drive, but only if he promises not to tell anyone what his investigator does/does not find on it. And the way the story now reads on the KXLY post, Todd's home was searched one day and he was arrested the next! Wasn't Todd arrested first and then his home searched? This revision falls perfectly into line with the way the WSP says it does business in the article - namely seizing evidence without any notice to the alleged perpetrator (so he/she can't erase it), examining that evidence and then making the arrest if there is, indeed, evidence. But, that's not what happened, is it? And even, it was, why would they seize evidence, arrest a suspect and then examine the evidence?